September « 2009 « NerdOut! Gran Turismo vs Forza Motorsports: My 2 cents. First let me preface this with some history. I purposely chipped my first PlayStation just so i can play the Japanese version of Gran Turismo since the American version wasn’t going to be out for a few months. Yea, the chip ended up breaking my PS1, and I had to start all over again when i got the American version of the game. But damn, those 4 months were some great practice. this still makes me want to get out there and race. oh the variety of cars, the realness of them… i see them on the road, in the showrooms, THEY EXIST! I hadn’t tried out too many race simulators. I think i gave a NASCAR game a try once, but got really bored and thrown off by how hard it was. I just thought it sucked, but turns out, its kinda hard to go 200mph into turn, banked or not. I played some of the arcade style racing games, you know, go fast, don’t worry about the brakes, and slide into every turn… wee. But once you figure out how things work, and memorize the courses, the games were just a boring exercise. I used to put cars in 360 spins around corners in RidgeRacer without even getting close to crashing. Then Gran Turismo came around. Right off the bat, first race, i slam my Civic into the wall. yea, turns out, you gotta slow down to turn, just like real life. I ended up reading the little book that came with the game. It explained the different types of cars, how to takes different types of turns, and also the balance between braking/turning/accelerating. I played through those pretty regularly all the way up to Gran Turismo 4 on Playstation 2 (which i still ‘practice’ on). Now, GT4 was really good. It had rally cars along with rally tracks which was pretty rad on its own (GT3 first had rally in it). But, in my opinion, was still sticking with the limiting License tests. You had to beat a seriers of tests, basic ones that have you go, and stop in a small area. Others make you take a set of turns you have to clear in a set time. The last test for each license usually required you to do a perfect lap in a predetermined car. A perfect lap meant you car could not go off the track, nor could you hit any walls. Yea, it got hard. I soon got to a place in the game where i couldn’t go any further. I had beaten all the races my Licenses allowed me to, and in order to race the rest, i had to get a license whose tests i couldnt pass. I got bored, and moved on. Eventually I ended up picking up an Xbox to play halo, and picked up the first Forza Motorsports for the hell of it. I dug it, felt a little different from Gran Turismo, a little more updated and weighty. Each one of the Gran Turismo’s physics engine got better, more realistic. But wow, Forza had something going for it. Yea, there was some wonkyness in it. But, it was also the first to simulate car damge, not just cosmetically, but it also affects the performance. If you banged up you left front tire, it would pull. If you bashed the front hard enough, you damage the engine and slow down big time. In Gran Turismo, you just bounced off the wall if you hit it straight on, not a dent. yea, thats my car. 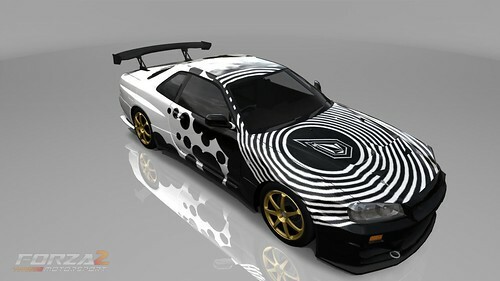 A Nissan Skyline GT-R V-Spec with a custom design, and no, those Volcom logos do not come with the game. I made them out of warped triangles and hexagons. Yea, i’m that nerdy. This game was like starting all over again, i had to change the way i played. The Xbox 360 control has two triggers on each side, and each one was brake/gas. You couldn’t just floor it all the time anymore, you’d spin out coming out of a turn. Slamming your brakes just made your tires lock up and slide off the track. You had to ease on and off… finesse it. I had these hard pounding races where i was just barely holding on to first place, or spending six laps just to get into first in the last turn. You had to draft, move around opponents instead of just bumping them around (you got a time penalty added to your lap time too). you had to wait for the right time to go in and pass, because if you chose the wrong time to be on the outside, you end up losing a couple places. this was all from in game footage (not me.). insane, but, thats whats possible. So, Where do i stand on it all. GT4 and Forza 2 are the newest versions of the game currently commercially available. Graphics aside, Forza 2 is still, in my opinion, the better of the two games. But, (as of writting) Forza 3 is not available for another month. 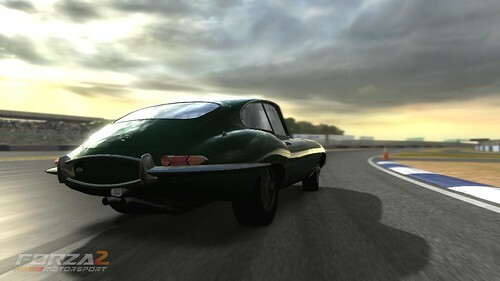 Gran Turismo 5 is not coming out until March, 2010, if were lucky. Its probably going to get delayed though, GT4 was delayed a year and a half and the developer, Digital Polyphony takes the “its not coming out til its DONE.” stance. so, who knows, my bet… it’ll come out Oct/Nov, 2010. I’m getting both, i’ve got too, i’ve been too into both of the games to chose one. I’m stoked for Forza 3 for the ol’reliable, but hope that Gran Turismo has some fresh air breathed into it. Its got some great graphics, but the all new ‘damage’ system looks weak, and cars still bounce off of walls. But i’m still keeping my fingers crossed. One of them is going to be great. if both are, well, bonus points.